In anticipation for the incoming blizzard yesterday, my family decided to hunker down in the house for some quality family time. I did a little baking and then we worked on some jigsaw puzzles while we listened to Christmas music by Mariah Carey. 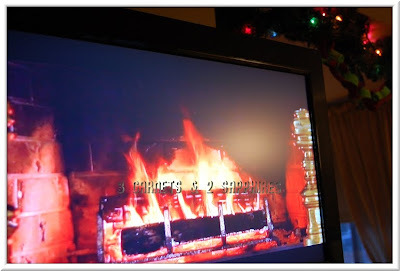 This music DVD is part of Sony Music's Yule Log series, in which Christmas music plays along to one of three holiday scenes. You can choose to listen to holiday music with either a yule log burning in the fireplace, the inside of a cozy cottage decorated for the holidays, or an evening outdoor snow scene with a cabin lit from within. We played ours on a Sony Playstation console rather than a DVD player, so we had difficulties figuring out which button would allow us to switch between the scenes. We ended up just enjoying the fireplace, which is the default scene. Because this DVD is meant to play in the background, I do wish that there were more than ten holiday songs. Since we were not sitting with our attention focused on the television as we would if we were watching a movie, the music seemed to end quickly. There are at least 17 different Christmas Classics - The Yule Log Edition DVDs available. Artists include Celine Dion, Kenny G, Kenny Chesney, and more. I think these DVDs are a great idea for a hostess gift because they are ideal for playing in the background and creating some ambiance during a holiday party. I also think these DVDs would be perfect to send to someone who cannot be home for Christmas due to work or being away at school. In addition to the Legacy Recordings Store, you should be able to find these holiday music DVDs on Amazon.com and at your local music retailer. Thank you to Sony Music for providing us with a sample Yule Log DVD to review.